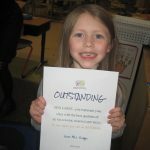 This week she gave an OUTSTANDING award to one particular kinder……MIA…..for making awesome green choices that show she is “IS NICE, WORKS HARD AND IS READY TO LEARN”. Congratulations, Mia! 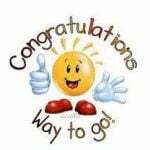 This entry was posted in News from Mrs. Bohl and tagged award, outstanding kinder on March 18, 2018 by kathybohl.